Ways To Apply Blush Like No-one Ever Told You! Apply Blush with a Polished and Professional Finish! 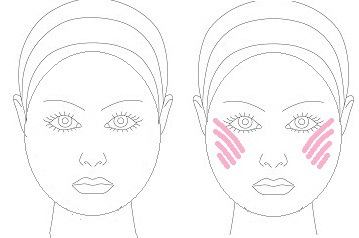 Find and apply the right blush by keeping your combination of skin type, and color in mind. 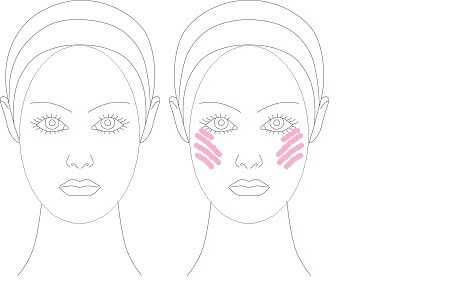 This is followed by a guideline for applying the blush in accordance with your face shape. First consider the type of skin you have. Dry cheeks tend to respond better to cream blush. A creamy blush is also very thin and sheer, this lets you layer a little better. Sometimes the state of your skin may change with the seasons, age, and changing climates. So just be aware of the type of skin you have at different times and apply blush that is suitable. Another factor is the base you’re wearing underneath. If you are wearing a powder foundation, then a powder blush will complement it better, and vice versa. If you’re not wearing any foundation at all, then a creamier blush will be better so as not to dry out the skin. Ideally, the color you want is the one you see when you naturally blush. This is assuming you don’t get too flushed when you do blush. This is also assuming that your skin is not so dark that the flush doesn’t come through your cheeks. In these cases we’ll use other methods to determine the right color blush. A more appropriate avenue then would be to make a fist for a while. The rush of blood that comes through will show you your color. Another way is to pinch your cheeks, gently… Don’t hurt them! Then just check the color that comes through after that. If none of the above work for you, use a general guide. Light, pale skin will be better suited by lighter colors, while the darker your skin is, the deeper your complementing blush colors can get. Try out different shades at the makeup counter to find your 'happy' color. For example, if you’ve just dyed you hair blond, your overall color profile might become lighter because your skin seems lighter. Just remember to keep it looking soft, without deviating too much from your natural coloring. Sometimes, you might not even like your natural blush color, then just don't use it. Find a color that you like that makes you feel good, as long as it doesn't look overly unnatural. Firstly, use a good quality blush brush. or the are examples of good quality affordable brushes to have in your bag. Dip it into the jar so that the blush is just on the surface, and tap on the side to get rid of the excess. You don’t want to start off with too much. That can make it more difficult to blend and see mistakes before they happen. If you have a brighter shade of blush, dust that just over the apple of the cheek for a little pop of color. Faces can be classified into four basic shapes. This is just to simplify because there are just too many different shapes to consider. So the best thing is to identify the shape that your face would most readily fit into. We will go through square, round, oval, and heart. I’ve included the illustrations below so that you can see the technique. They are also to show you a comparison of the effect to the eye just by adding blush in a certain way to your face shape. A square face has a strong angled jaw and is generally wide. It is a little heavier and stronger than other shapes. If you’re still not sure if you have a square face, here’s a tip. Your hands will generally correspond to the shape of your face. If the ends of your fingers, natural nails, and general hand shape also resemble a square, you probably safely fall into this category. Application for a square face is similar to that of the round face. This is because you’re giving a little elongation to your profile. With the square, you’ll also be taking the eye away from sharp jaw. Apply the blush on the hollows of the cheeks towards the outer corners of the eyes. Don’t go as far as the temples. Like a rounded triangle pointing to the bottom of your ears. Use your discretion in figuring out whether to make it more triangular, or whether you’re suited by more of a soft line. The key is to make sure the blush is more concentrated n the upper part of the cheek, and remains very soft. If you take it lower, this puts emphasis on the lower lines of the face. The basic round face is the same length from any part to another. For example, the length from ear to ear is roughly the same as the diagonal length from the left of your forehead to the right jaw. 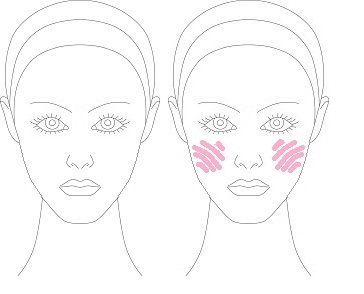 The point of the blush method here is to slim down the face while still maintaining and enhancing that cuteness of your round face. Apply the blush along your cheekbone starting from right under the iris when looking forward, to your temple. Do this in an up and down motion. Then blend it to the apples of your cheeks in little dabs. You’re basically drawing a bit of a triangle that is pointing to your nose…To brighten up your face, give yourself a big smile, and add a little more blush right in the middle of the apple... Just ensure that the color is not too close to the ears. 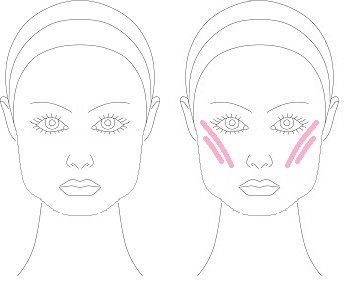 To give that illusion of fuller cheeks, apply the blush on the apples of the cheeks. Then blend it also across the hollows of your cheeks under the apple. An oval shaped face is actually a combination of the round, and the heart shaped face. Apply the blush across the cheekbone, but keep it to just under the outside of the eye, not to the temples. Because your facial features are so balanced, there’s no need to apply the blush lower on your face as this will make your jaw look heavier. Tip: With blush, it’s really important to blend properly! So remember to put on a little at a time. Make sure that the previous layer is fully blended before you put on any more. Besides adding a little color, blush can also add a few other dimensions to your face. For An Extremely Long Face: When applying blush, you can take it even lower than that shown for an oval or square face.This will fill the face and make it look a bit rounder and shorter. Put a dab of blush on the front part of the chin, just under the lip dip. This must just be really faint and it will help to make the face look a little shorter. For a Narrow Face: You can put some blush on the bottom of the ear to make it look a little wider. Apply it very lightly so that it’s not as intense as the cheek. Another tip is to opt for button earrings instead of long drop earrings as these make your face seem even longer. Now That You Can Apply Blush Like a Pro, learn about more ways to enhance your face shape with these eyebrow shapes.